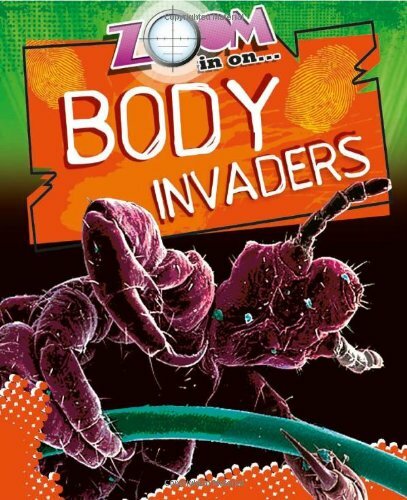 This book on the tiny things that live on or invade our bodies and on how they can be studied has the approach and format of the traditional children’s information book. It is organised in double spreads explaining the nature of each life form and there are good retrieval devices: contents page, index and a particularly helpful glossary. How do we study and understand creatures too small to see with the naked eye? The merit of the book lies in the clear explanations of how modern technology allows scientists to study such things such as bed bugs, lice, ticks, worms and viruses. Curved pieces of glass have been used to bend light rays to magnify an image. But we now also have what are termed ‘scanning electron microscopes’ which use electrons rather than light to magnify. SEMs bounce electrons off surfaces to create images. Young readers will be amazed to learn that these images can magnify by almost a million times. The book will also help illuminate children’s concept of scale. Throughout scales are placed next to images to give a sense of relative size. So the miniscule follicle bug, an eyelash bug that helps keep the follicles clean, is shown magnified 1,860 times. There is much to interest and inform young readers here – the bed bug nightmare in New York in 2010 for example. The image of the enlarged bed bug is a fearsome sight! There is also good advice for avoiding things like ticks which can be a serious threat to health. The well planned pages, the often startling images and the quality information make this a good addition to the science books in the classroom or school library.